This is the most present snack in our house but never got to blog about it or take pictures of it. Last week my sis asked for the recipe and since then I am trying to find time to post it. So, this one is for you sis! Mash the bananas and mix them on high speed for 2-3 minutes. Add the eggs, sugar and vanilla and mix on high speed for about 5-6 minutes untill double in volume and fluffy. Separately sift the flour, baking powder, baking soda and cinnamon. Add this to the bananas and mix just until blended with an offset spatula, taking care not to deflate the batter. You can bake it at this point or you can add chocolate chips (previously refrigerated) or raisins (previously soaked in rum) or cranberries or whatever mix of dried fruits/ nuts you feel like. 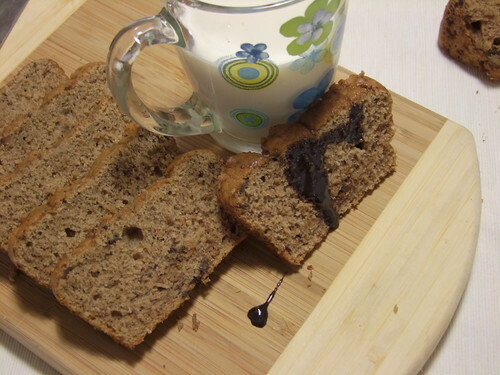 Bake the cake for about 40 minutes or until a tester inserted inside comes out clean. The cake can be baked in 2 loaf pans (5/ 22 cm) or in a bigger cake pan or in muffin cups (decrease baking time in this case). 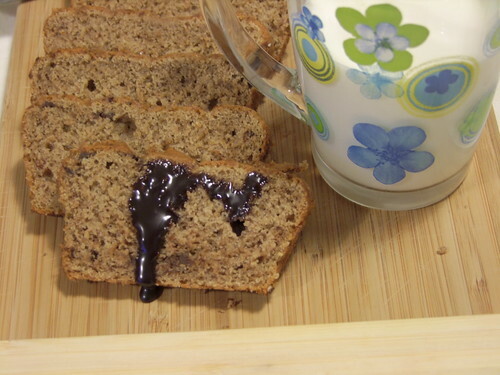 It is great with a cup of milk on the side, drizzled with some chocolate sauce or just plain.